Today, I’m continuing the reviews for the Free RPG day adventures I picked up at Origins. Last time, we covered the first two D&D 4E offerings, Treasure of Talon Pass and Kyber’s Harvest. Today, we travel to the harsh deserts of Athas and the eerie environs of the Shadowfell. Dark Sun was a favorite campaign setting of mine, coming out in the heyday of my high school/college D&D days. I’ve been intrigued by the 4E version of Athas, though I’ve not taken the plunge by buying any products… yet. 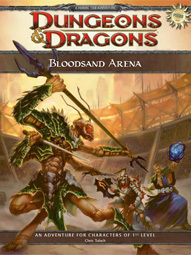 Bloodsand Arena came out a few months before the Dark Sun material in 2010, and was developed by Chris Tulach. It begins with a six page introduction to the unique qualities of Athas: unusual races, a lack of dieties, and the use of defiling magic, among others. Two brief adventures follow, each of which would likely take up a short evening session. The first sees the PCs as caravan guards, who are eventually betrayed and forced to settle their dispute with their former employers in the gladiatorial arena. The second mini-adventure features another arena fight and a quick “whodunit?” mystery. A large two sided poster map and full-color, cardstock pregenerated characters round out the package. I was very impressed with Bloodsand Arena. It is an excellent introduction to Dark Sun, featuring encounters that are synonymous with the world: guarding a caravan through the harsh desert and fighting in a savage, sandy arena. Skill challenges and role-playing opportunities abound, and there is plenty of space devoted to adventure hooks. The gorgeous map includes three different encounter areas, suitable for even non-Athasian campaigns. It is a far better introduction to Dark Sun than Khyber’s Harvest was to Eberron. I really want to run this adventure as soon as possible. By far, this is my favorite of the four Free RPG Day adventures, though my fondness for the setting may have influenced this somewhat. I only wish it were longer! Rating: 18 on a D20. This year’s offering is quite different than the other three. 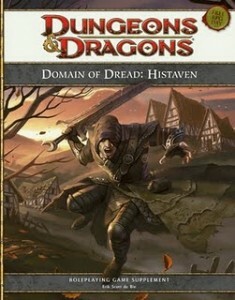 Billed as a “Role Playing Game Supplement”, rather than an adventure, Histaven is designed by Erik Scott de Bie. It ties into the recent release The Shadowfell: Gloomwrought and Beyond, which I am only passingly familiar with. I get the impression that this little book might have started as a bit of content from that product. At only 14 pages in length, it is short, but is definitely chock full of content. The full color art and slick paper are very nice, indeed. Aimed at late heroic and early paragon tier in level, Histaven feels like less of an introductory product designed to pull in new players than something that established fans would enjoy. Whether that is a good decision for a Free RPG Day product is debatable. Histhaven is a relatively small location that could pop up in any campaign, very much like the Ravenloft settings of old. A detailed history of the domain, including stat blocks for important NPCs, takes up most of the booklet. The primary conflict, between the Rag Man and Count Artius, provides an interesting story, but I found the vagueness of the Rag Man’s grudge a bit confusing. There is plenty of advice on roleplaying NPCs, possible story hooks, and the like, but precious little in the way of encounters and maps. Histhaven is a compelling place to adventure, a well designed sandbox, but DMs will need to do a lot of prep work themselves, or be very good at improvising to use it effectively. Domain of Dread: Histaven does what it sets out to do pretty well, but it’s an odd choice for new or inexperienced players. Rating: 15 on a D20.